“Fushikino” was a word often used by Sennorikyu, who had profound influence on “Chanoyu”, the Japanese "Way of Tea". The word “Fushikino” coincides with other Japanese words such as ”Fushigi (miraculous) ” or “Fushiki (innocent)” which are used in the teachings of Japanese ZEN. If it were translated into modern term, it will mean “something unexpected” or “something new”. 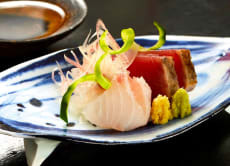 By choosing the word deeply linked to Sennorikyu for our restaurant’s name, we learn from Chanoyu culture, furthermore, we sincerely hope to serve you a pleasant and unexpected thrill from à la carte to SAKE as you have never tasted before.